But we are more interested in airsoft version! I had both spring powered execution so I dare such an assessment! I will not uncritical, but the owners UHC forgive me. 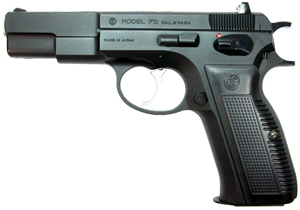 UHC CZ75 is a weapon from a manufacturer who prefers rather than the cost of manufacturing before product quality. For weapons you will encounter a number of shortcomings! Immediately after the first shootings find weaknesses in the quality of the material and, over time the gun is not function altogether. Of the two pieces I broke in one trigger that is really very fragile. And the second broke striker! The weapon is also should be greased regularly, otherwise it is shot several times smaller. However, there is a very favorable purchase price and appearance of the gun (This is due realistic artwork :-)) is nice too! 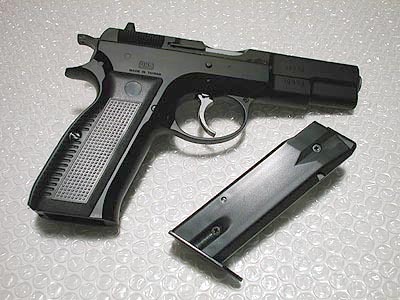 On the other hand is the version from Tokyo Marui. Here is traditionally meet with precision manufacturing, and by the looks of the final model! But Marui can have its flies. 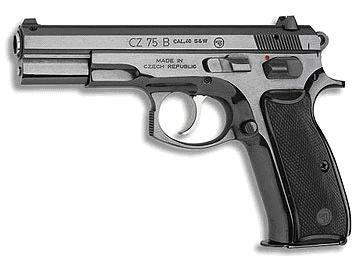 Cz has one bigger, that is noticeable already at the first shot guns! 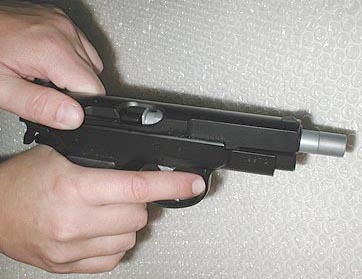 For this problem can not help no one else than the Czech arms factory, unfortunately they did not count with the manual version and stretching with every shot! Yes, the problem is stretching ... stretching just goes very hard. Rather, there's nothing to properly grab a weapon! But it can be stretched from the front and with a little practice soon stretch well unmistakably like Glock. Visually are the weapons almost comparable! As a secundary weapon to long spring powered gun or AEG would rather vote for UHC! Visually, they serve well and the price is favorable! UHC shoots version by the manufacturer recommended BBs weight 0.12 grams. In practice this means that when you hit something it's rather a coincidence :-) Well, I exaggerate, range is around 10-15 meters. But if the wind blows you can be sure of nothing! I had the chance to try out cheaper BBs 0.12 g with visible imperfections. Such BBs flew, one up and one down ... So if you want this weapon to hit anything, so I recommend a precision BBs 0.12 g.
So the in shooting comes out as winner without discussion version of Marui. Magazine of both guns is on 25 BBs. At UHC version is very common that the magazine does not feed, jams etc. Marui is seamless and does not disappoint. Both are fully compatible. If someone wants to spare, I might vote for UHC, because it is cheaper. As I wrote, both are completely identical in shape! CZ holds great! Fits your hand like a glove. And instinctive shooting from it is quite effective. Important on the gun are also sights . How else than plastic!! Sights are classic open. They could be more recessed, but after meeting with them you can fairly head! The sights are not laterally or vertically adjustable. But that does not hinder on the gun. Someone not enough UHC and wants more ... 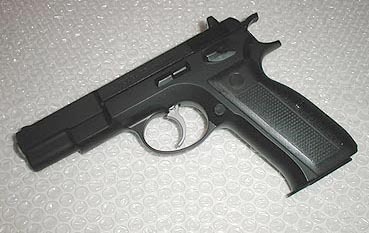 Overall, a better model offers manufacturer Marui. But also for the larger price. If you opt for this version, and it's clear that you will not get the money the next day to another better weapon, it would be probably a good to know if you really want it! Therefore, I would wait a moment and bought the Scorpion, which is a class better. Or invest in a used spring powered gun.